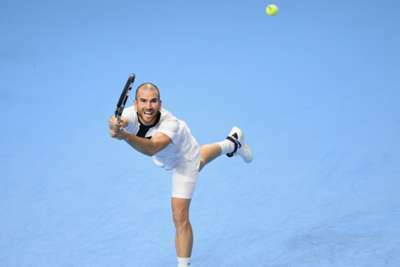 Adrian Mannarino will face top seed Marco Cecchinato in the second round of the Kremlin Cup after ending a six-match losing streak by beating Evgeny Karlovskiy on Monday. Mannarino had not tasted victory since defeating Cecchinato in Cincinnati two months ago but the Frenchman stopped the rot with a 3-6 6-4 7-6 (7-4) success over wildcard Karlovskiy. Mannarino will have to be more clinical when he takes on Cecchinato, having converted only one of 12 break-point opportunities in Moscow. Aljaz Bedene also advanced with a 5-7 6-4 7-6 (7-2) victory against Laslo Djere, while qualifier Lukas Rosol saw off Matteo Berrettini 6-3 4-6 6-4. Feliciano Lopez advanced to round two of the European Open with a 6-4 7-6 (7-5) win against seventh seed Frances Tiafoe in Antwerp. Vasek Pospisil moved into the last 16 with a 6-3 7-5 triumph over Leonardo Mayer, with Jiri Vesely and Mackenzie McDonald also progressing at the expense of Jaume Munar and Nicolas Jarry respectively. Denis Kudla overcame Guillermo Garcia-Lopez in the first round of the Stockholm Open, beating the Spaniard 6-2 7-5. The 135-ranked Elias Ymer rallied from a set down to see off Maximilian Marterer, the home favourite winning 4-6 7-5 7-5.